Playgrounds, youth centres, and community services have been attacked since 2010. The three main political parties have pledged more cuts after the General Election in May. That means less staff, less hours, less pay, or simply the sudden closure of more valued community spaces. In London, we want to get organised to stop this happening. If you’re a youth worker, a playworker, a parent, or someone who uses one of these services, please come along to our campaign launch on Tuesday 7th April (exactly one month before the General Election). 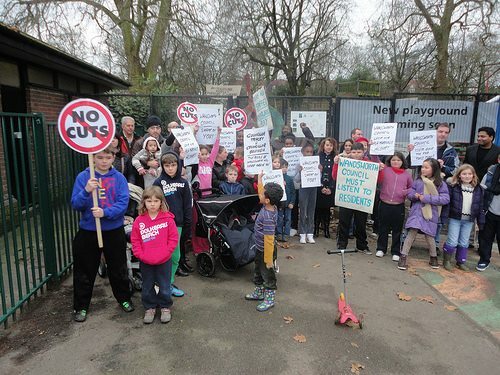 In 2012, Wandsworth Council decided to close Battersea Park Adventure Playground, in what they claimed would save £386,000. Considering the low maintenance costs of the playground and the low wages of the three full-time staff that were sacked, it is hard to know how they arrived at £386,000. Despite protests organised by local mothers and children, the council went ahead with their plans. At the time, they said the playground would be closed, refurbished, and re-opened as an unsupervised space. What the council actually did in 2014 was re-open the playground but divided in two: one half free and the other an exclusive, privately-run service that costs £20 per child. Before the playground had been an open community service, where teenagers (who often lack safe, constructive spaces in cities) built long-term relationships with staff and their peers, and felt ownership over the environment. Such spaces are rare in London. Now, the company Go Ape! have opened a private (and no doubt profitable) ‘attraction’, designed for the once-a-year enjoyment of those who can afford it. This has nothing to do with the community values that underpinned adventure playgrounds when they first sprang up on derelict land in the 1970s. If we want to stop this happening to other playgrounds and youth centres, we need to strengthen links between workers, parents, and children across London. We need to raise awareness about the importance of these services and the threats they face. We need to support each others local battles. We need to be ready for the next time they try to cut. Previous IDYW 6th National Conference Photos – Folk enjoying themselves far too much! Next The League of Young Voters say Register Now!